Plus they're made with healthier white whole wheat flour and soy milk. I love the slightly nutty flavor (well, it tastes nutty-ish to me) that soy milk adds to baked goods. I find myself using it as a dairy milk substitute almost all the time now. 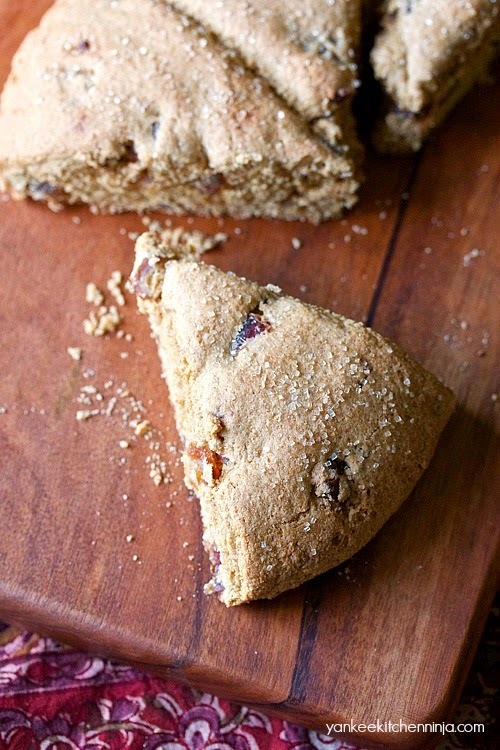 And there's no mixer required for this scone recipe. Just one bowl and your own two hands (I find that cutting in butter with your fingers is much more efficient than using a pastry blender... and it gives you an awesome arm workout!). 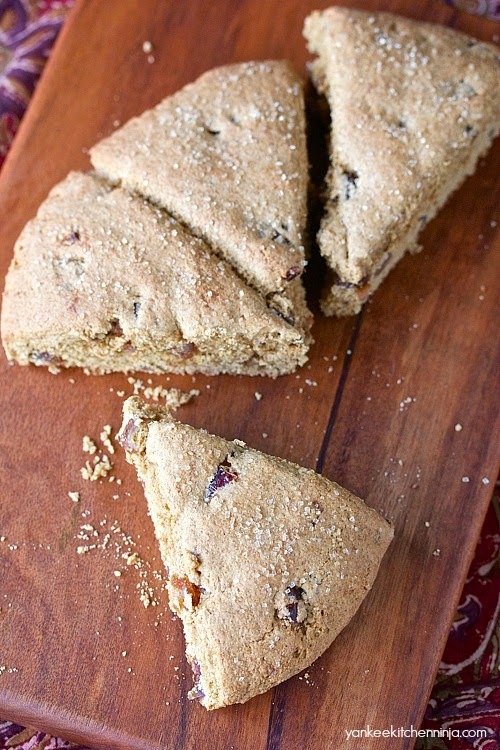 Warm from the oven, these maple date scones make a really delightful breakfast treat. Completely cooled and tucked into your lunch bag, they're a nice afternoon snack with a cup of tea or a latte. What's your take on sweets? Sweet as can be or less sweet the way I prefer them? Leave a comment: The Ninj wants to know. Whisk together the first 5 ingredients (flour through salt) in a bowl. Add the butter and, using your fingers, blend it into the flour mixture until incorporated and the mixture looks like coarse meal. In another smaller bowl, whisk together the milk and maple syrup, then add it to the flour mixture, along with the dates. Stir until just moistened. Turn the dough out onto a lightly floured surface (dough will be very sticky). With floured hands, knead the dough a few times, transfer it to a baking sheet lined with parchment paper and pat it into an 8- to 9-inch circle. Cut the circle into 8 wedges, being sure not to cut all the way through (you're basically scoring the dough). Sprinkle the surface very lightly with turbinado sugar, if using. Bake for about 15 minutes or until nicely golden. Completely cut wedges through before serving. I love that these are whole wheat! So much wholesome, country flavor in these scones. :) Pinning. 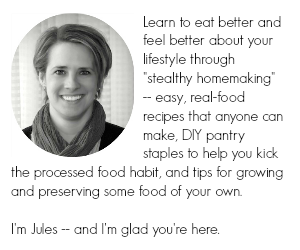 Sounds like you love scones as much as I do, Marye -- thanks for pinning! Jules - I'm usually a sweetie sweet girl. I would've been right there with your sister, looking for extra sugar. But these scones look absolutely amazing, and being a New England girl, I love all things maple syrup. These will be perfect with my afternoon cup of chai tea! I know, she thought I was some sort of freak. :-) And I can vouch for the fact that these are wicked good with chai -- enjoy, Allie! Love this recipe and the ingredients (yay, dates!). These are so pretty, too! Thanks, Patricia -- I'm love baking with dates! I'm always looking for breakfast dishes that are less sweet. This recipe looks sooo good! 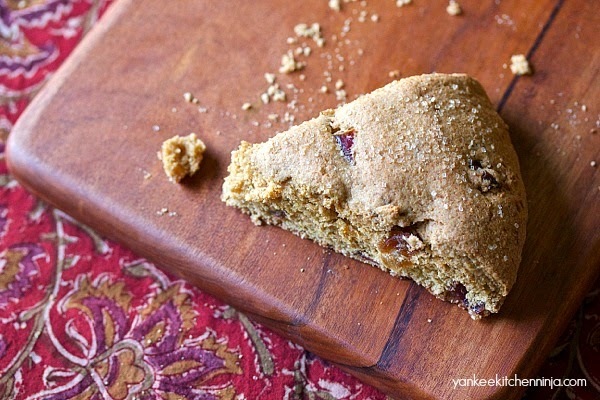 Then I think you'll love this scone recipe, Lindsay -- thanks for checking it out!